Harmony Korine is a filmmaker truly unlike any other, and one that defies all conventional ideas about what films can and should be. Originally garnering cult fame for films like Gummo (1997) and Julien Donkey Boy (1999), as well as his script for the infamous Kids (1995), Korine took a step into the “mainstream” with his surprisingly successful Spring Breakers (2012). The Beach Bum is his second film in that “mainstream” vein, and it is his widest-released film to date. However, if you’re unfamiliar with the man’s work, you’d do best to familiarize yourself before seeing it. While Spring Breakers is undoubtedly his most widely “accessible” film, The Beach Bum is a return to the form of his earlier work in many ways. Korine has developed a style of story telling that he has dubbed a “liquid narrative” format, and as a fan I can say with the utmost certainty that this would be jarring to the unsuspecting viewer. The term “liquid narrative” refers to how he shoots and edits his films. Traditionally, a “scene” is made up of various takes edited together to form the action and dialog into a coherent flow, but Korine takes the traditional editing style and shakes it up. While dialog is edited coherently, the backdrop of a conversation could change between four or five different locations, and the action being carried out could vary just as widely. This brings me to the main point: The Beach Bum feels as disjointed as a whole as the style in which it is made. That being said, I cannot recommend that you see it enough. It is not for everybody, as is the case with much of Korine’s body of work, but it is for the open-minded film buff. The Beach Bum‘s very loose plot follows Moondog (Matthew McConaughey), a burnout poet who bums around the Florida Keys in the everlasting search for a good time. Moondog is called home to Miami by his radically wealthy wife Minnie (Isla Fisher) to attend their daughter’s wedding. Immediately following a tragedy involving his wife, Moondog is faced with a choice: finish his next book of poetry or lose access to all of the wealth he has been able to throw away without thought. 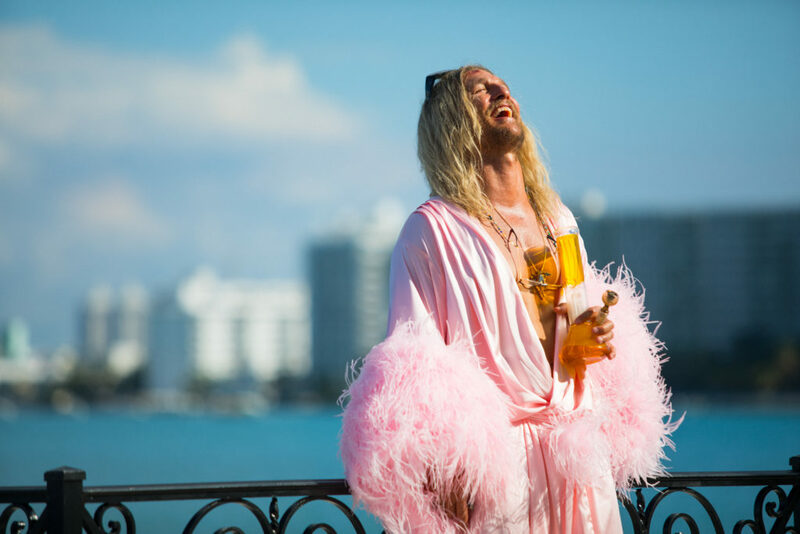 From there, the film follows Moondog on a very strange odyssey around the southern part of Florida and the Keys as he works on his book and meets a colorful cast of characters played by Zac Efron, Martin Lawrence, Snoop Dogg, Jimmy Buffett, and others. While The Beach Bum starts and ends very strong, I cannot deny that the meat of the film feels as though it meanders around, rambles, and flat out goes in circles at times. The main draw of the film is undoubtedly the interesting characters Korine has crafted to exist in yet another one of his strange, surreal takes on Florida life. Moondog is undeniably charming despite all of his flaws, and even though he is his own worst enemy you can’t help but feel sympathetic towards him. Written like some sort of prophet that has fallen from grace, Moondog floats through life spreading his sermon of having a good time to everybody he crosses paths with. These people include a preacher’s son he meets in rehab (Efron), a dolphin-obsessed tour guide (Lawrence), and a fictionalized version of Snoop Dogg, among others. Each of them bring a new perspective into the life of Moondog and in return, he to them. The film’s structure is based almost entirely on these interactions, and can be best described as a collection of vignettes. As I said before, the plot is very loose. This film is primarily a character study, and understandably many viewers will not enjoy it, as evidenced by the wildly polarizing reviews available online, and the fact that it’s 2019’s biggest box office flop so far. But once again: I can not recommend it enough for someone looking for something different from the usual cinematic fare. The film is a love letter to the free spirit, to the idea that maybe the only thing that matters in this life is enjoying ourselves. The film takes a good hard look at what “success” really means to different people, and muses on the idea that maybe it’s not as complicated as we’re made to believe. As Moondog states late in the film, “fun is the gun,” and if there is one thing I took away from the two times I saw it during its very short theatrical run, it would be this: maybe it’s time to lighten up, stop to smell the roses, and to let a little more sunshine into my admittedly hectic life. The Beach Bum is nothing short of entertaining, so long as you understand what you’re getting yourself into when you watch it. It is endlessly charming, very funny at times, and just may be the exact message the American public needs to hear during these chaotic and arguably dark times in our history. Still playing at AMC Boston Common– see it while you still can!